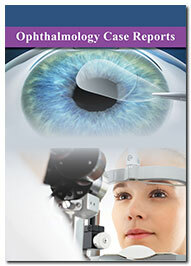 Ophthalmology case reports is assumed and it is very crucial area of research. The anatomical, physiological, and diseases of eye parts cumulatively named as opthalmology case reports As the eye is one of the vital organs in Human body, the need and importance of studying it stands pivotal. Starting from the size and shape of eye, moving onto its working and eventually diagnosing and finally treating them comes under Ophthalmic. Opthalmology case reports is an international journal publishing high quality research from different parts of the world. Researchers dealing with Eye Research can disseminate their work to this journal which is internationally acclaimed and having formidable scientists in reviewer and editorial board. All types of manuscripts are welcomed for publishing in this esteemed Journal. ﻿Opthalmology case reports conveys and aims majorly pertaining to clinical and experimental examination of eye and disorders, also experimental therapeutics inside of the fields of Opthalmic Research. It additionally gives cutting edge audits on clinical and experimental treatments. Subjects covered also include physiological and therapeutic aspects of Eye Research. Opthalmology case reports is a scientific open access journal that deals and describes the developmental activities conducted in the vast field of Eye research. This journal encompasses the study related to Acanthamoeba Keratitis , Amblyopia (Lazy Eye), Astigmatism, Bell's Palsy, Black Eye, Blepharitis, Cataracts, CMV Retinitis, Colour Blindness, Conjunctivitis (Pink Eye), Cornea Transplant, Corneal Ulcer, Detached Retina, Diabetic Retinopathy, Diplopia (Double Vision), Glaucoma, Hyperopia (Farsightedness), Macular Degeneration (AMD), Macular Dystrophy, Ocular Migraine, Ophthalmology, Ptosis (Drooping Eyelid), Retinitis Pigmentosa, Eye disorder in Pregnancy, Uveitis and many more. Submission of important articles containing advanced research output aiding in forwarding the subject are most welcome. The wide scope of the journal will aid in contributing a great measure of scientific information related to the advances in towards better healthcare. The Journal is using Editor Manager System for easy online tracking and managing of the manuscript processing. Each article undergoes a peer review process under the aegis of an assigned Editor. To be acceptable for publication, an article should be positively considered by two individual reviewers followed by the Editor’s consent.